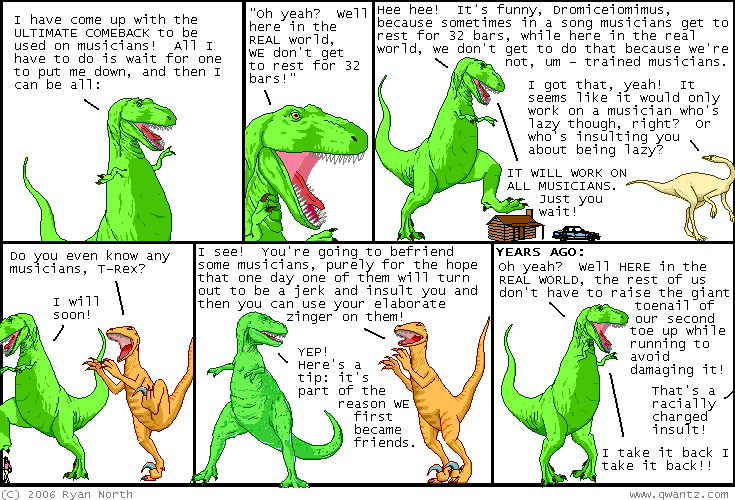 Dinosaur Comics - November 1st, 2006 - awesome fun times! –It can get pretty bad and embarrassing, I gotta say! November 1st, 2006: Ladies and dudes it's November! To celebrate the FIRST OF NOVEMBER I am going to link to some awesome comics that I've linked to before but they're still totally rad. Minus is by Ryan Armand who is a favourite artist of mine from way back - he did these rad guest comics a few years ago. This Minus comic is awesome! The most recent update: also awesome! Dresden Codak is by Aaron Diaz and is a fantastic comic that's a little like the late great A Lesson is Learned but is its own thing as well is a very excellent. Also the website is gorgeous and it's what I wished my website looked like. This comic will make you want to marry Aaron Diaz. Also this entry is getting a bit long but check out everyone in the Koala Wallop collective because seriously they are all comics I love. I Am A Rocket Builder is inventive, adorable and hilarious! I always have good things to say about Perfect Stars (seriously)! And The Secret Crocodile Adventure Club just keeps getting better. One year ago today: too many friends?